BBC Radio 1 presenter Nick Grimshaw has been ridiculed by farmers and industry commentators on Twitter after stating the dairy farm used to hold the Glastonbury music festival was ’the most vegan friendly place on the planet’. Farmers including Andrew Gilman, Tamworth, were quick to react to Mr Grimshaw’s faux pas, reminding him that Worthy Farm was in fact a working dairy farm. 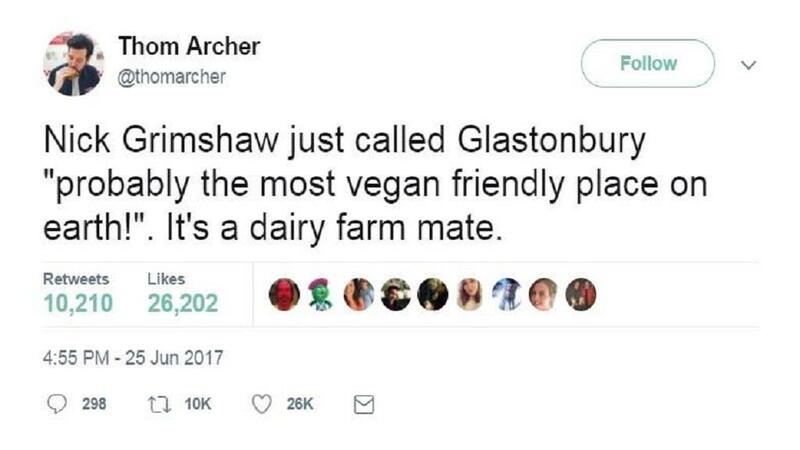 Food writer Thom Archer wrote on Twitter: "Nick Grimshaw just called Glastonbury ’probably the most vegan friendly place on earth! It’s a dairy farm mate’. The comments sparked a Twitter frenzy, with others highlighting the damage done to the environment and the rubbish some festival goers left behind. Farmer Jon Watson wrote: "Diesel generators, all the plastic waste, all the human waste, the flood lighting affecting wildlife." In 2014 Glastonbury founder and dairy farmer Michael Eavis was awarded the Royal Association of British Dairy Farmers (RABDF) Gold Cup. Nick Grimshaw just called Glastonbury "probably the most vegan friendly place on earth!". It’s a dairy farm mate. Nick Grimshaw just called Glastonbury "probably the most vegan friendly place on earth!". It's a dairy farm mate.